Play therapy is a psychotherapeutic treatment approach specifically developed to help children between the ages of three to 12 years old. A trained mental health professional, called a play therapist, works with a child to explore and resolve problems through the therapeutic use of play. Therapists strategically utilize play therapy to help children express what is troubling them when they do not have the verbal language to express their thoughts and feelings. In play therapy, toys are like the child's words and play is the child's language. Play is the child's language and it is a fun, enjoyable activity that elevates our spirits and brightens our outlook on life. It expands self-expression, self-knowledge, self-actualization, and self-efficacy. Play relieves feelings of stress and boredom, connects us to people in a positive way, stimulates creative thinking and exploration, regulates our emotions, and boosts our ego. In addition, play allows us to practice skills and roles needed for survival. Learning and development are best fostered through play. Children are referred for play therapy to resolve their problems. Often, children have used up their own problem solving tools and they misbehave or act out at home, with friends, and at school. 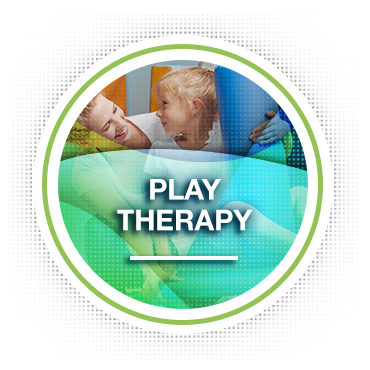 Play therapy allows trained mental health practitioners who specialize in play therapy to assess and understand children's play. Further, play therapy is utilized to help children cope with difficult emotions and find solutions to problems. By confronting problems in the clinical Play Therapy setting, children find healthier solutions. Play therapy allows children to change the way they think about, feel toward, and resolve their concerns. Even the most troubling problems can be confronted in play therapy and lasting resolutions can be discovered, rehearsed, mastered, and adapted into lifelong strategies. Research supports the effectiveness of play therapy with children experiencing a wide variety of social, emotional, behavioral, and learning problems, including: children whose problems are related to life stressors, such as divorce, death, relocation, hospitalization, or chronic illness; children who assimilate stressful experiences; and children who have experienced physical and/or sexual abuse, domestic violence, or natural disasters. How are Families Involved in Play Therapy? The play therapist will make some decisions about how and when to involve some or all members of the family in the play therapy. At a minimum, the therapist will want to communicate regularly with the child's caretakers to develop a plan for resolving problems as they are identified and to monitor the progress of the treatment. Other options might include involving a) the parents or caretakers directly in the treatment by modifying how they interact with the child at home and b) the whole family in family play therapy. Whatever the level of involvement of the family members, they typically play an important role in the child's healing.